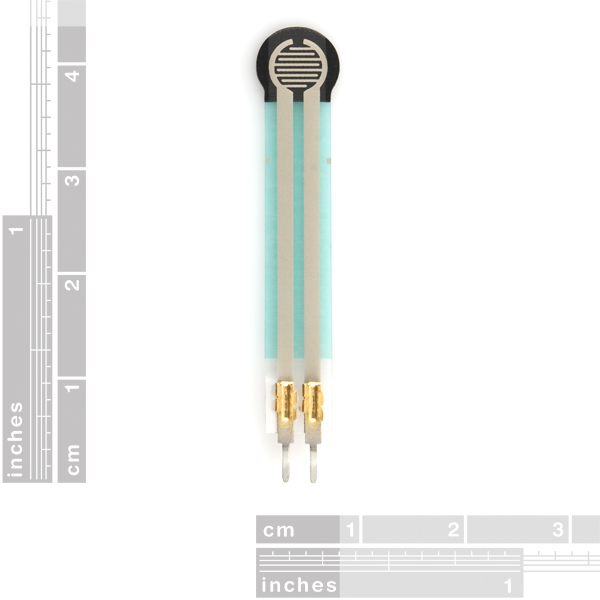 This is a small force sensitive resistor. 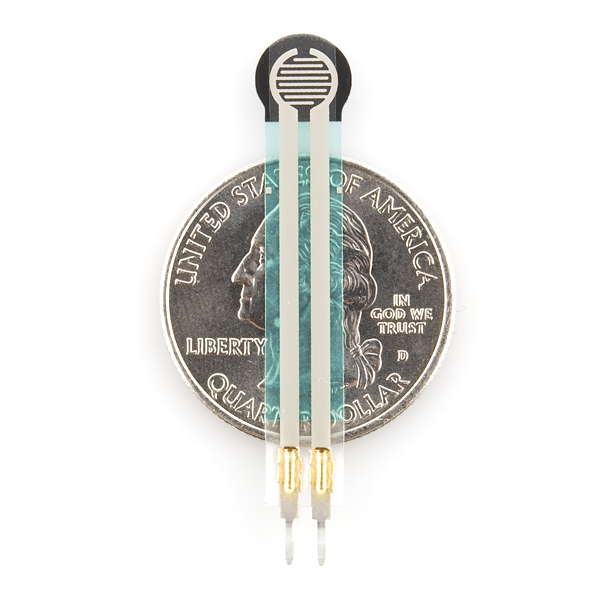 It has a 0.16" (4 mm) diameter active sensing area. This FSR from Interlink Electronics will vary its resistance depending on how much pressure is being applied to the sensing area. The harder the force, the lower the resistance. When no pressure is being applied to the FSR, its resistance will be larger than 1MΩ, with full pressure applied the resistance will be 2.5kΩ. Wide force sensitivity range 0.1N - 10N* Overall length: 1.75"
hello, can i cut the legs and re connect it without damage the sensor? 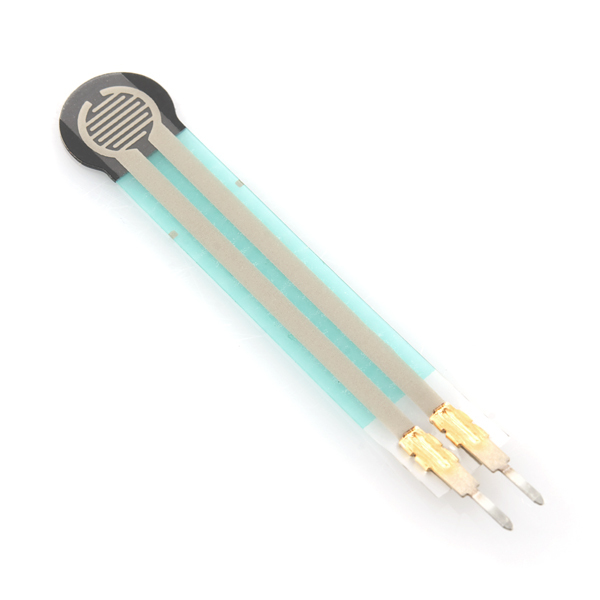 So can these resistors really use the force? Hmm, maybe put 4 of these under the corners of a plate of glass, and do some crappy calculations on an Arduino for an X/Y pad? can I put 2 or more fsr on top of each other and extend their range? after playing with 2 of these, the silver ink cracked near the crimped on connector. after the 1st one cracked i was very careful with the 2nd one and tried to not bend it much and taped it to a rigid backing, but after a while the ink again cracked and the sensor was useless. anyone have any ideas for a solution? can i use this sensor for mass measurement ? You can use them for a rough scale measurement, but as it states in the description, they aren't exceptionally accurate. If you are looking for something more suited for a scale, take a look at our Load Sensor. Do you have ZIF or other appropriate connectors for these sensors? I really like how the power button works on my my Apple Cinema Display. It's touch sensitive. No click or push, you just have to touch it ever so slightly and the monitor turns on or off. I'd love to have a touch sensitive button like that in my project. Is this what they're using? Your looking for a capacitive touch sensor and either the related software/code (if your MPU supports capacitive touch which many Atmel and PIC devices do) or a capacitive touch controller that can handle charging and measuring the sensor. I'm looking to create a floor piano (like in the movie "Big") by putting pressure sensors of some kind into a padded material that looks like a keyboard. When the padded material gets stepped on, I want to play a note. Would this be a good sensor to use for this type of project? I know that they "aren't incredibly accurate" but all I need is an indication that there is SOME type of pressure on the material, not a specific number. Although a pressure sensitive resistor is the right type of sensor for your application, I think you'd want a bigger sensor if your "keys" are operated by a person's foot. Something like this 1.75" by 1.5" square pad would give you a larger detection area, especially if you are going to add padding. The size of this sensor was another one of my worries, so you providing an alternative is incredibly helpful. The square pad looks very promising, thanks! According to the FSR Integration Guide, one should not directly solder on the wires. I obviously would not like to damage one of these. Could you give me some advice? Is there any adequate connector around here? From looking on other sites, it looks like a standard 0.1" female "header" strip should connect to it. Are there any tutorials on how to work with one of these and an Arduino? I purchased one of these but wishing I could figure out how to use it. I hooked it up to my Arduino in a simple manner to get a sensor reading thinking I would get a some range out of it but when no pressure is applied I get fluctuating readings any where from 0 to 400 range and when I press it I get a reading of either 1022 or 1023.
is this ever going to be in stock again? Been waiting since middle of the summer. I bought two of these resistors and set them up with a particle photon to measure/monitor the milk and coffee levels at our office. Despite the difference in weight between the two, a simple adjustment in the resistance of the second portion of the circuit allowed me to easily calibrate the FSRs to the desired sensitivity. My only complaint would be that soldering leads to the pins was slightly difficult because they are so close to each other. Its so small, I misplaced it. So I ordered three more. I will let you know when I get to try one in the next few weeks. I have follow the guidelines to use the sensor and it works just fine. However due to lack of experience i cannot use it for my current project i'm doing. Thank you by the way and happy to have business with your team. Thank you and have a nice day.